Passing a boating safety course will give you a discount on boat insurance and will increase your water safety skills. Boat safety courses are an excellent investment of time and money, regardless of your state's boating law. 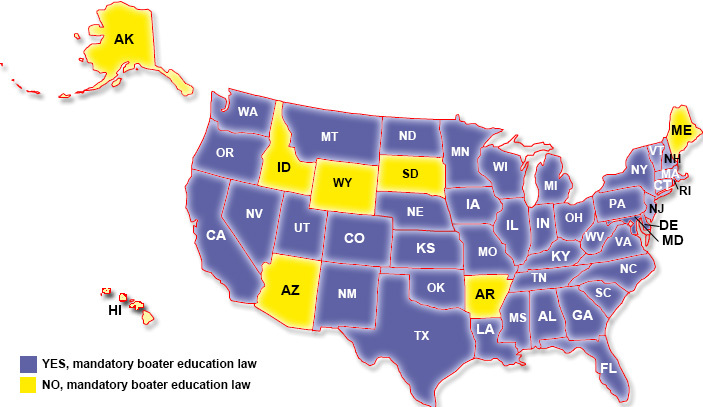 Each state has unique boating education requirements, and the boating rules, laws and regulations vary from state to state for obtaining a boat license or safety certification. Be sure to review the full legal requirements for your particular state. Yes, state has mandatory boater education law that applies to some operators of boats and/or personal watercraft. As of July 1, 2015, all PWC operators age 14 and older and motorboat operators 50 and younger must complete a boating safety course. Beginning July 1, 2016, all PWC operators age 14 and older and all motorboat operators regardless of age need to take a boating safety course. See the state's website for specific safe boating course requirements. View the official Virginia boating web site here.